The About section gives you an opportunity to share information about yourself as an evolving, aspiring designer, musician, writer, entrepreneur. You might include your design philosophy, aesthetic point of view, interests, your approach to your work. This is also a place where you might place a self portrait. About pages are often the most highly-trafficked pages. This makes sense as it is often found in your navigation, and people can’t resist clicking on it. 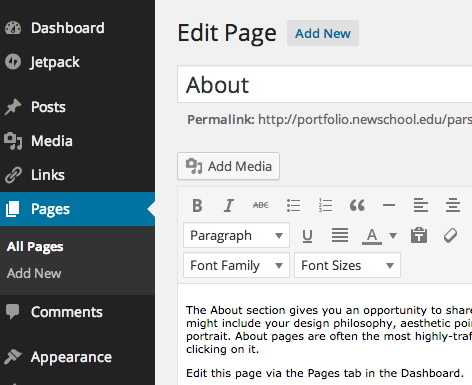 You can edit this page via the Pages tab in the Dashboard.